The café is a place where people go not merely to drink but also to think, and the above quotes from diverse sources and eras reveal why cafés are so important. A contemporary student of bohemia (something we shall discuss at length below) cites the visionary French social theorist Charles Fourier (who did much of his observations from stagecoaches, in hotels and the restaurants of these establishments because he was a traveling salesman) on humanity’s natural propensity to conspire. The late nineteenth-century British novelist and poet Thomas Hardy reveals how even under the influence of drink in a modest semi-public pub working-class patrons and their sociability can transform this banal, ordinary place into a palace. Finally the post-modern contemporary novelist Thomas Pynchon puts his finger on why the great cafés of Europe have always attracted not only ordinary people but also intellectuals and why these spaces that fuse banality and creativity are therefore so vital to intellectual and artistic life. Several chapters in this volume—covering the famous Enlightenment memoirist Giacomo Casanova, eighteenth-century Paris cafés and the discussion and invective within them, and the variety of cafés frequented by Jews in Eastern Europe around the turn of the twentieth century—reveal this social brassage: the rubbing of shoulders and sensibilities and their stimulating effects. In short, cafés are central to intellectual history because the social interaction and solitary introspection within them fulfill vital human needs: nurturing human perceptions with beverages, sights, smells, and sounds these spaces have had a dramatic impact on intellectual history at various points. Caffeine today is people’s number one choice of stimulant, and the coffee trade is second only to oil in global commodities. Though the history of the discovery and diffusion of coffee remains as murky as a cup of the brew, almost all scholars agree that by 1438 or so Sufis in Yemen were using a newly discovered stimulant to keep awake and alert during their religious exercises and devotions. Coffee and the first coffeehouses worried Islamic rulers, jurists, and market inspectors from the outset. In 1511 in Mecca, Islamic jurists decreed that although some places that served the beverage might pose a threat to public morality, the drink itself could not be outlawed simply on the supposition of its evil effects without just proof. This principle, as Ralph Hattox has shown, became part of Islamic law and ensured that coffeehouses, although often shut, were never banned—as was the sale and consumption of alcohol. Wherever coffee and cafés spread in the Muslim world, whether to Cairo or Istanbul by 1600 or so, similar fears arose alongside the use of the beverage by Sufis and writers. The first book to document the effects of caffeine was Abdalcader Alanzar’s 1587 treatise What ought to be sincerely and distinctly believed concerning coffee that is, if it be lawful for a Mussulman to drink it. This Muslim writer discussed the origins, effects, diffusion, and disputes at Mecca over cahouah (coffee) and concluded by citing poetry in praise of it. This is one of the first publications reflecting the intellectual life of coffee and cafés. It was said of Socrates, that he brought Philosophy down from Heaven, to inhabit among Men, and I shall be ambitious to have it said of me, that I have brought Philosophy out of closets and libraries, Schools, and Colleges, to dwell in Clubs and Assemblies, at Tea-Tables and in Coffee-houses. In that issue Addison and Steele encouraged their readers, who they estimated numbered about 10 percent of London’s population, to “consider it part of the tea-equipage.” Much of the reading of the magazine took place in coffeehouses, which accounts for why even though the publishers printed only 3,000 copies they could claim that so much of the metropolis followed their narratives on the news of the day, good manners, and morals—including those of polite conversation in public places. By the time Samuel Johnson published his Dictionary (1755) we see the link between coffeehouse and newspaper as virtually defining such places: “A house of entertainment where coffee is sold, and the guests are supplied with newspapers.” The cost of these first papers was such that few outside the elite could afford them and hence enterprising coffeehouse owners seized the opportunity to add another attraction to their commercial establishments by subscribing to them. Some of the luminaries who constituted this first coffeehouse culture included the generation from Samuel Pepys in the late seventeenth and early eighteenth centuries to Robert Hooke, James Boswell, and down to Thomas Paine at the end of the Age of Enlightenment. Pepys was the first connoisseur of coffeehouse life, sampling a wide variety of these places and recording their conversational style and comportments. From the time of Thomas Babington Macaulay’s first edition of The History of England from the Accession of James II (1848) historians began to see the coffeehouse as a key to a growing democratization of English society in the reign of Queen Anne. But by the early nineteenth century English coffeehouses had been transformed either into gentlemen’s clubs or restaurants. When a great new establishment, the Café Royal—the creation of a French wine merchant on the run from creditors—emerged in London during the 1860s it was more a stage for the celebrities of the late Victorian and Edwardian eras than for polite and reasoned conversations centered on the news of the day. For example it was the stage upon which Oscar Wilde and other late nineteenth-century British writers left indelible impressions. As coffeehouse culture declined in England so it flourished on the continent. In the early 1800s continental Europe’s café culture was in its infancy while that of London was in its senescence. The first Paris café opened in 1671, followed in 1668 by the Café Procope—theoldest still operating; in Venice the date was 1683, while Rome’s classic Caffè Greco dates only from 1760. Vienna’s first café opened in 1685 and by 1779 the imperial city still had only 11. Coffee and cafés would come even later to Germany, Russia and Sweden. Coffee is very much in use in Paris: there are many public houses where it is distributed. In some of these houses one talks of news, in others one plays chess. There’s one where coffee is prepared in such a way that it gives spirit to those who drink it: at least, of all those leaving the café, not one believes that they drank four times as much as they intended on entering. The strong coffee of St. Domangue drunk by Buffon, Diderot and by Rousseau, added its heat to warm souls, sharpening the vision of the prophets in the assemblies at the Procope, who saw the radiant future of 1789 at the bottom of the black beverage in their cups. This coffee is not like other ornate mirrors, gilt and busts, but it is adorned with the memory of the Great Men who have attended and whose articles cover the walls if they were stored. By the early nineteenth century the Procope had become the prototype of the intellectual café that spread across Europe in the wake of the French Revolution and the Napoleonic and romantic eras. Cafés played a key role across Europe in the Revolutions of 1848. Examples include the Caffè Tommaseo in Trieste and the Martini in Milan; the Griensteidl and the Daum in Vienna; the Pilvax in Pest (Hungary); and the Marrare de Polmento in Lisbon. Cafés then played their part in the diffusion of artistic bohemians across the continent after 1850, patterned on the Latin Quarter of Paris first celebrated by Henri Murger in his novel Scènes de la vie de bohème and then by Puccini in his opera La bohème. [The] café becomes the true home of citizens of the city evolved, is cultivated and acquired more and more independence. With respect to the “liberation” it was their home, their latest refuge, even their night shelter, he was also a place of equality, a democratic institution where all may enter without fear, rich and poor, masters and servants, women and homes. In the second half of the nineteenth century Vienna cafés such as the Griensteidl, the Central, and the Herrenhof flourished and set the model for taking almost every major newspaper of the continent (and some from the Americas) as well as a wide selection of magazine and sometimes books. Here was the world of the flâneur that Walter Benjamin evokes in the writings of Baudelaire and in his own study of Paris and its arcades as the capital of the nineteenth century. In short, there developed a “culture of cafés in great European cities.” Dugast sees the café as taking over much of the role of the salons. Literary cafés especially multiply in this period between 1880 and 1900 and on through the pre-war decade. Cafés would play a central role in sparking Impressionism in France, Expressionism in Germany and the Young Vienna (Jugendstil) literary movement. Some of the writers who “incarnated” the literary culture of these various cultures, Lemaire feels, are Peter Altenberg at the Café Central in Vienna, Franz Kafka at the Arco in Prague, Fernando Pessoa at the various cafés of Lisbon (including the legendary Marrare de Polimento and the still extant Martinho da Arcada), and Max Beerbohm at the Café Royal in London. This volume includes several chapters dealing with this literary flowering. In “The End of a False Summer: Aspects of Viennese Literary Culture around 1900” Egon Schwarz explores café literary culture at its height and Herbert Lederer’s “The Viennese Coffee House: History and Cultural Significance” unpacks the image of the literary café in the lives of these writers. These analyses provide greater historical context for Harold B. Segel’s superb collection of primary sources, The Viennese Coffeehouse Wits, 1890-1938, which will be discussed below. Also in this volume, Florin Berindeanu’s “Art at Il Caffè Florian” provides an exemplary analysis of the role of the café in the work and life of painters. Bohemians of the Latin Quarter inspired the first modern cabaret in Paris that emerged in the new bohemian quarter after the Paris Commune—Montmartre. Rodolphe Salis, an entrepreneurial entertainment agent, created the Chat Noir in 1881. Later, when Salis moved, his establishment became the site of Aristide Bruant’s cabaret Le Mirliton. Here this student of Parisian working-class life created his own cabaret singing style, with its rough tone, proletarian slang, and frequent insults aimed at the middle-class clientele in the audience. Indeed studies all note that neither the Great War nor World War II diminished intellectual café life. In Paris, especially in the Saint-Germain-des-Prés district, one of the great intellectual café cultures of Europe would flourish through the 1950s. It was only in the post-1945 boom and with the dramatic reordering of daily life and the rise of consumer culture and mass tourism that the intellectual café would go into decline during the 1960s. My chapter on Jean-Paul Sartre and Ernesto Livorni’s on Florence’s Guibbe Rosse explore the last stage of this intellectual café flowering. From western Portugal to St. Petersburg, you have cafés, places where you can come in the morning, order a cup of coffee or a glass of wine, spend the day reading the world’s newspapers, playing chess and writing. The bibliography of magnificent books written in cafés is enormous. There are people who have always worked that way and preferred to. You don’t have them in Moscow, which is an Asian frontier city. The line can be sharply drawn: Odessa is about the limit of the café. I’m a café creature, not a pub creature. The English pub is a very different animal, and the American bar is a profoundly different animal again. I’m at home everywhere in Europe because I go to a café the moment I arrive, either have a chess game, challenge somebody, or have them bring the papers for me on those wooden sticks, the old-fashioned ones where you roll them up, and it’s the most egalitarian society in the world because the price of one cup of coffee or glass of wine buys you the day at the table, and you can write, you can do anything. After my lectures in Geneva, my students always knew at which café I would have my second coffee of the morning, or a glass of white wine, and they could come and chat. That’s where the intellectual life really blazes. 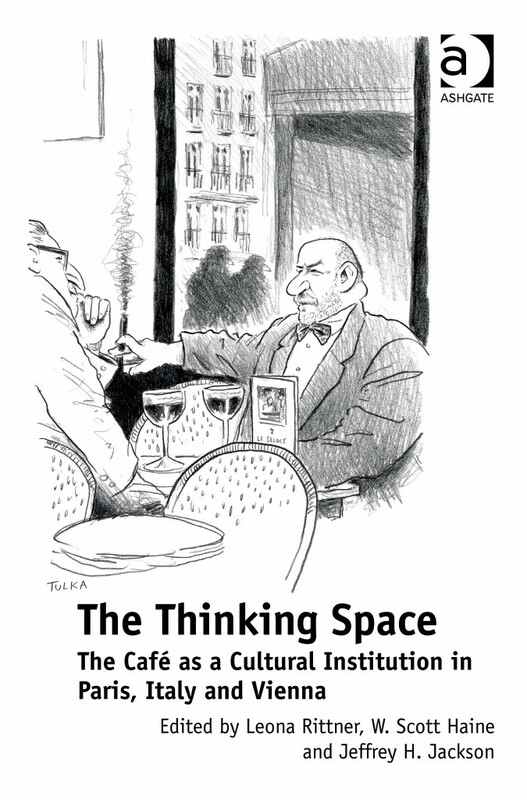 Part Two: “The Thinking Space: The Café as a Cultural Institution in Paris, Italy and Vienna” (Excerpt, Part Two) published on A Woman’s Paris®. Quoted by Steve Bradshaw in the frontispiece of his Café Society: Bohemian Life from Swift to Bob Dylan (London: Weidenfeld & Nicolson, 1978). New York: Empire Books, 2012, 19. New York: Viking, 1973, 262–3. The following two books provide a brief overview. Shaun Gallagher, How the Body Shapes the Mind (Oxford: Clarendon, 2005) and Alva Noë, Out of Our Heads: Why You Are Not Your Brain, and Other Lessons from the Biology of Consciousness (New York: Hill and Wang, 2009). Gallagher stresses a “consensus across the disciplines that the contribution of embodiment to cognition is inescapable” (p. 1) and that “to ask about the prenoetic effects of embodiment is to ask about … how the body anticipates and sets the stage for consciousness” (p. 2). He also notes a strong link between movement and cognition and the fact that the body is the source of spatiality (p. 8). Noë confirms that “consciousness something we do or make more like dancing than digestion” (p. xii) and that “The environment itself is what enables me to find my way around it … like my brain; my body, my eyes, and the city itself belong to what enables me to find my way about” (p. 82). He continues: “I agree with the philosophers Andy Clark and David Chambers that there is no principled reason not to think of the wristwatch, the landmarks, the pen and paper, the linguistic community, as belonging to my mind” (p. 82); “Beyond the social division of linguistic labor, Putnam also believes that linguistic meaning depends on one’s being embedded in an environment“ (p. 90); and then finally examining the sea snail: “more remarkable still, what drives the whole process of physiological reorganization is the stimulating environment” (pp. 92–3). It is thus not surprising, given this new paradigm in the study of consciousness based on neuroscience, that Kathleen V. Wider in her study The Bodily Nature of Consciousness: Sartre and Contemporary Philosophy of Mind (Ithaca: Cornell University Press, 1997) notes: “The last decade has brought a tremendous resurgence of interest in the nature of consciousness … During the same decade there has been a revival of interest in the philosophy of Jean-Paul Sartre.” She then goes on: “In Being and Nothingness, Sartre has shown with a great deal of subtlety, wit, and detail the power and consequences of” of the “belief in the reflexivity of consciousness” (p. 1). It is thus fitting that Sartre, a habitué of the café when writing this classic, should be found relevant by neuroscientists wishing to explore the nature of the embeddings of consciousness. A classic image of early humans gathered around a Neolithic campfire is found in Jack London, John Barleycorn (1913; New York: Oxford University Press, 2009). One recent book has collected testimonies on the power of tea for creativity; see Katrina Ávila Munichiello, A Tea Reader: Living Life One Cup at a Time: An Anthology of Readings for Tea Lovers Old and New (North Clarendon, VT: Tuttle Publishing, 2011). Markman Ellis, The Coffee House: A Cultural History (London: Weidenfeld & Nicolson, 2004), xi. Ralph S. Hattox, Coffee and Coffeehouses: The Origins of a Social Beverage in the Medieval Near East (Seattle: University of Washington Press, 1985). Ellis, The Coffee House, 15. For example Gérard-Georges Lemaire’s Les cafés littéraires (Paris: Éditions de la Différence, 1997), the most comprehensive overview of the subject, does not mention London’s. Ellis, The Coffee House, 185–6. Lawrence E. Klein, Shaftesbury and the Cultures of Politeness: Moral Discourse and Cultural Politics in Early Eighteenth Century England (Cambridge: Cambridge University Press, 1994). Ellis, The Coffee House, 56–7. Ellis, The Coffee House, xiii. Ellis notes that Macaulay’s nephew, George Macaulay Trevelyan, confirmed and elaborated on the role of the coffeehouse in his England under Queen Anne: Blenheim (London: Longmans, Green and Co., 1930). See also Edward Forbes Robinson, The Early History of the Coffee-Houses in England (London: Kegan Paul, Trench, Trübner, 1893); Steven Pincus, “Coffee Politicians Does Create”: Coffeehouses and Restoration Political Culture,” Journal of Modern History 67, 4 (1995), 807–34. Ellis, The Coffee House, 207–24. “Le fort café de Saint-Domangue bu par Buffon, par Diderot, par Rousseau, ajouta sa chaleur aux ames chaleureuses, à la vue percante des prophetes assemblees dans l’autre du Procope, qui vinrent au fond du noir breuvage le futur rayon de 1789.” In his volume on French history entitled The Regency, cited in Lemaire, Les cafés littéraires, 81. Lemaire, Les cafés littéraires, 298–9, 405, 457, and 489. Jacques Dugast, La vie culturelle en Europe au tournant des XIXe et XXe siècles (2001; Rennes: Presses Universitaires de Rennes, 2011), 85. Palmen Doynov, Le temps d’un café. Café-poems translated from the Bulgarian by Ralista Frison-Roche (Paris: Caractères, 2006). Dugast 98 citing Gyula Zeke et al., Les cafés littéraires de Budapest: anthologie de textes littéraires hongrois et photographies anciennes (Nantes: Éditions de le Passeur, 1998). My translation. Lemaire, Les cafés littéraires, 403. I show the pervasiveness of working-class insults to the police and the legal repression these words entailed in my The World of the Paris Café: Sociability Among the French Working Class 1789–1914 (Baltimore: Johns Hopkins University Press, 1996) and I will elaborate on the connection with Bruant’s art and that of others in an forthcoming book on cafés, urbanization, and culture in the Paris region 1914–2014. “EUROPE is built on its cafés and coffee houses, the intellectual George Steiner once argued. Draw a map of the continent’s cafés, from Lisbon to Odessa, and you will have before you the makings of a guide to European identity. “If this blog has an ambition, it is to be a sort of European coffee house, where passing readers can find modest ideas and bits of information that may prompt further thought, like a shot of caffeine during a long day. If readers care to stay awhile, sink into an armchair and offer their comments to fellow patrons: well, that is all part of café life too. “Now here comes the gentlest of requests from the man behind the bar. In a coffee house, the customer who shouts his opinions rarely gains a larger audience for his thoughts. Equally, if his angry interjections have little to do with the conversation underway before his arrival, other customers may simply wander off. “Firmly held views are welcome. Charlemagne, for his part, is a journalist, and as such has a thick skin. But, please, be polite to each other. Think twice before posting anything that is too loud, aggressive or rude. Have the courtesy to read postings, and the comments on them, before leaping in to attack. There have been a handful of furious assaults on ideas that nobody was advancing. Leave a reply on "“The Thinking Space: The Café as a Cultural Institution in Paris, Italy and Vienna” (Excerpt, Part One)"